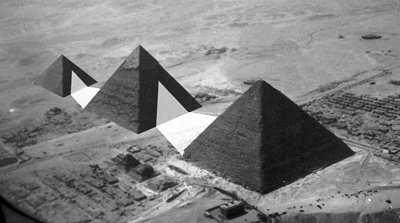 The experiment carried out with the same or the first construction allows us to understand, why the Giza Pyramids were built edge to each other. Such deployment prevents the sunrays reflected from a pyramid to hit a neighboring pyramid. Thus, all three pyramids remain cold that helps to maintain the temperature contrast of the cold center (pyramid) and hot environment. Such distribution of temperature favors formation of a specific shapes of clouds which in turn stimulate the formation of a tornado. If the builders placed the pyramids side by side, then the sunlight reflected from one pyramid would fall to the other pyramid and warm it. In the author’s opinion it was not a part of the plan of the Egyptians. See details in the book “Personal Tornado for Pharaoh’s Soul” (the second and third editions). 1. The figure shows the conditional scheme of the midday sunbeams reflected off the walls of the Giza pyramid. 2. 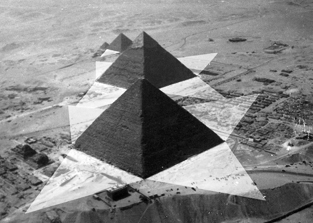 The second figure shows the result of the artificial movement of the Giza pyramids.